Do you want a happy tailwaggin' dog? Whether you call it dog biscuits, dog snacks, or dog cookies why not give your dog the best dog treats available. Grain Free / Gluten Free All Natural Bandit's Biscuits are healthy dog treats. No grain, no wheat, no artificial preservatives or flavors; all natural ingredients always. 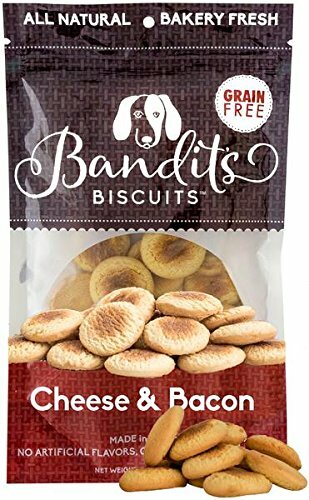 Bandit's Biscuits are made in the USA only. Why Bandit's Biscuits? All Natural Healthy Ingredients. You won't need to be a science teacher to read our ingredient list! Made with ingredients you could find in your kitchen. Garbanzo bean flour, apple juice, Cheddar Cheese & Bacon, eggs, and flax seed oil. Grain Free / Gluten Free. Wheat free, grain free, gluten free, no wheat, no corn, no fillers how many more ways can we say NO GRAINS! We use garbanzo bean flour rather than grain flour for those dogs that have grain sensitivity or are allergic to grains. Bakery Fresh! Baked in small batches to crunchy perfection. This ensures that you receive the freshest possible dog treats. They are Proudly Made in the USA and packaged in a resealable pouch. Perfect Bite Size for medium and large dogs. Easily broken for small dogs and to use as training dog treats. Tailwaggin' dogs across the country LOVE Bandit's Biscuits. Your dog will too or your money back, no questions asked. Click the ADD TO CART button now and SAVE money by adding another flavor or bag! CHEESE & BACON Dog Treats fresh baked to Crunchy Low Calorie Perfection. Made in the USA only. GRAIN FREE / GLUTEN FREE DOG TREATS - Corn Free, Wheat Free, and Soy Free! Safe for pets with grain sensitivity or allergies. Best quality limited ingredient all natural dog treats. ALL NATURAL HEALTHY DOG TREATS - Made with high quality limited ingredients you would find in your kitchen. Perfect size for large and medium dogs. Easily broken for small dogs. Perfect dog training treats for your big dog, senior dog, or little dog. BAKERY FRESH - Produced in Small Batches these dry dog treats are packaged in a Resealable Package to Ensure Freshness. MONEY BACK GUARANTEE if your dog doesn't like these treats. No questions asked. Volare Ent LLC is the only authorized distributor. Our guarantee does not extend to treats purchased from resellers. If you have any questions about this product by Bandit's Biscuits, contact us by completing and submitting the form below. If you are looking for a specif part number, please include it with your message. PetGuard Vegetarian Dog Biscuit Mr. Barky, 12 oz.